Calorie Restriction (CR) is the process of limiting caloric intake with the intention of slowing down aging. Some people refer to the concept as an anti aging diet. Research into Calorie Restriction has continued for many years – concluding that the lifespan of many animals (rats, monkeys, spiders) is extended when calorie intake is restricted. Times have changed and seniors want to be healthy and active pursuing activities like travel, yoga, and dancing well into their 80’s. However, the difficulty of Calorie Restriction is that sufficient nutrition (vitamins and minerals) must be maintained while lowering energy intake as much as possible. There are many adherents of a calorie restricted lifestyle – hoping to extend life. A Calorie Restricted diet must be slowly adopted. Losing more than 1 pound of weight per week is not recommended. This plan comprises 1700-1800 calories – but this should vary depending on age, weight, and exercise level. Here’s a good calculator to find your proper calorie deficit. Cook chicken (or other protein) as desired or use canned variety. Add to plate with broccoli and cauliflower. Add olive oil and herbs and spices. Have orange for dessert. Sprinkle vinegar and ½ tbsp olive oil and ½ herbs and spices over salad. Sprinkle ¼ tbsp olive oil and remaining herbs over fish. Sprinkle remaining olive oil over sweet potato (have this for dessert). Many more low Calorie recipes can be found here. How Can Calorie Restriction Slow Down Aging? The concept is still at the theoretical stage – and many theories exist as to why the various experiments on animals have resulted in longevity of life. However it appears that calorie restriction slows down the rate at which the telomere’s on our genes shorten, thus extending life. A good background primer on calorie restriction and anti-aging is available at Wikipedia. The Anti-Aging Diet Retails for $16.95. See also the Calorie Restriction Society’s website. We must also consider that what CR means today, in the past was the norm, the normal way of eating. My gradparents where I come from, used to live off the land and garden most summer days, veggies mostly, maybe some aged cheese. Winter will be mostly cured meats and preserved fruits and vegetables. Sugar was a rarity…had to go to the town to buy it…most sweet came from dried or fresh fruit. Also, the leats resourse a species used the longer it leaves..so not to overeat the rest of the species…its is not only environmental factors that makes us sick, although of course it does has a direct impact, but it is also out attitute toward nature the source of our food: we get from her as much as we feel like, we eat her up, like termites, demanding more and more producting, sucking the life out of her…this is her was of fighting back…we get sick earlier and with more agressive and terminal diseases. Earth survised millions of year before man appeared, don’t you think, she learned to defend herself? Jeez! 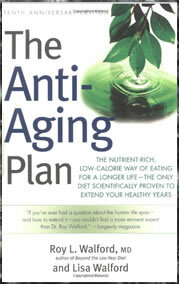 After being on this diet, I wouldn’t worry about aging any more because I’d probably starve to death before I get old! eat to live and not live to eat. is key to healthy life. healthy life is anti aging. People have never lived for several centuries. That’s pure religious myth and has no basis in fact. The Bible is about as valid on these things as tales of the Easter Bunny and Santa Clause. i am allergic to all nuts and several fruits. i am also a vegetarian and so hard to find a diet that will work with my lifestyle/food allergies. i wish i could eat nuts since they have so much protein. this looks like a great way to eat as you get older. thanks for the tips. This is nothing new, because eating less food is thousands of yrs old, in biblical or ancient times people ate very little and lived several centuries, also Elijah Muhammad of the N.O.I,also had his followers eating one meal a day over 70 years ago! DrCate – I couldn’t disagree more with your utterly pointless statement. Research IS ongoing and HAS been tested with animals of many types ranging from mice to chimpanzees for the last 20 years with regards to calorie restriction. The latest information suggests that calorie restriction diets activate a “longevity” gene that puts the body in a quick metabolism state. There is fundamental evolutionary research that suggests that this “survival” gene may be an adaptation that allows survival long enough during “lean” times for normal reproduction. Given that laboratory testing is ongoing and shows a very positive effect, you should not simply dismiss something like this without at least learning something about it. The definition of a caloric restriction used in these research papers is anything less than ad libitum. The research simply suggests that eating less than all-you-want is better. There is no animal research suggesting lifespan will increase if you go hungry. That would constitute animal cruelty and the studies couldn’t be done. i m an veggiterian.i want veg diet. eating lots and lots of fish, seaweed, green tea and vegitables are very effective in anti-aging. this is amazing. i would like to get my family started on this. I think a balanced food diet makes a whole lot of difference to anti-aging. I spend a lot of time researching online stuff and recently I found a program called elixxir which seems to have some fantastic results. When I saw those results I did some further probing and found that the product is an eating program based on a scientific anti-aging eating program. It is believed to product permanent lifelong weight loss and also claims to slash one’s risk for cancer, heart disease, stroke, diabetes, obesity thereby extending maximum lifespan by up to 50%. And apparently the good part is there are no meals or supplements you have to buy forever. It’s an eating program and all-natural. Sounds great but what about fluids?? Does this mean I can drink my normal 2 beers and 4 Dr Peppers? Common Sense is something most of us (me) don’t have so, I would like to see some guidance on beverage intake with this diet as well is Water the only option? This is the only diet known to modern science that extends BOTH average (mean) lifesapn and maximum lifespan.